The apportionment schedule listed landowners alphabetically by the initial letter of their surname, with the lands then arranged by occupants. This order has been retained in the transcript but, in addition, a list in numerical order gives just the owner and folio number for each entry. An alphabetical index of landowners and occupiers, including folio numbers, has also been provided. Extracts from the tithe map have been included in the centre of the booklet. A much reduced copy of the map is reproduced as the centrefold, preceded by a series of extracts, at the original scale, covering the main residential areas. Of particular note in Mitcham is the survival of strip cultivation from the medieval open-field systems in both the East and West Fields, and medium-scale extracts of these areas of the map have been included, each plot being annotated with the names of owners (in capitals) and occupiers (in normal script) and the use of the plot indicated in brackets (arable, meadow, pasture or wood). A set of small-scale maps, at the end of the booklet, show the holdings of major landowners and of the main occupiers, and also the use to which the land was put. headings of Sundry Owners and Sundry Occupiers. by Merton Historical Society as Local History Notes – 21.
fish, livestock, mills and minerals. support of a vicar (from the latin vicarius meaning substitute) to care for the parish’s spiritual life. family for two centuries, and it was his descendant, Emily Simpson, and her husband who held them in 1846.
family members served as vicars of Mitcham in the 19th century. and wood; Emily and William Simpson for the tithes of hay; and the Vicar for the remaining tithes. invoked, as disputes were usually settled locally. equal quantities of wheat, barley and oats at prices published annually in the London Gazette. each titheholder. These were then brought together at the end of the schedule to form an abstract of the holdings. cottage on plot 934 (folio 47) having been ignored. The rent charge totals are absolutely accurate. 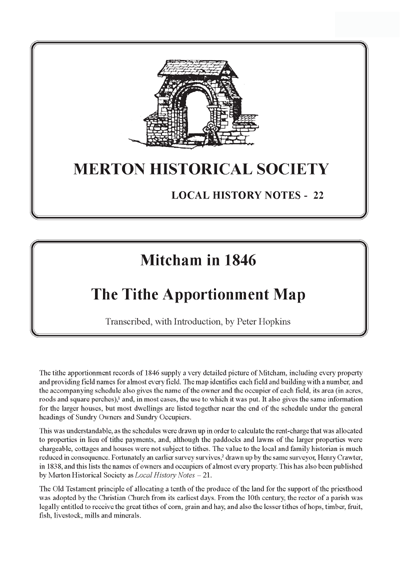 seems surprising – plot 1150a was actually in Merton parish, and paid tithe in Merton! among the most valuable sources for the study of local history. 1 in this transcript is numbered 5 on the photocopy, the introductory pages having been included in the numbering. occupiers, including folio numbers, has also been provided. a rectangular format, and this alignment has been retained here. occupiers (in normal script) and the use of the plot indicated in brackets (arable, meadow, pasture or wood). occupiers, and also the use to which the land was put. 1. 1 acre = 4 roods. 1 rood = 40 square perches. 1 acre = 0.405 hectares. £1 = 20 shillings (s) = 240 pence (d). 1s = 12d. 1 fo.21 In the 1838 survey, plots 1005-1007 totalled 3a 1r 34p. In 1846, 1006-1007 were not listed, but 1005 alone totalled 3a 1r 34p. 2 fo.22 In the 1838 survey, plots 1108-1112 totalled 9a 3r 22p. In 1846, 1109-1112 were not listed, but 1108 alone totalled 8a 3r 25p. Based on extracts from the tithe map by permission of Surrey History Service. This entry was posted in Publications, Local History Notes, Publications and tagged in lhn, mitcham, tithe, transcript, victorian mitcham.